Representing Athens State University and members of the 1st place team were Jeremy Boles (Team Captain & Athens State University Student SHRM Chapter President), Alethia Jordan, Brittany Grant, and Diana Woodward. 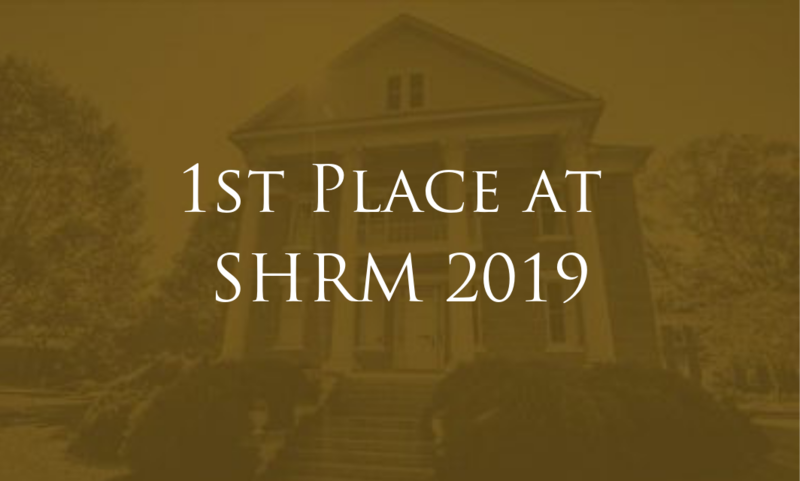 Human resource students from Athens State University won 1st Place at the Society for Human Resource Management (SHRM) Alabama/Mississippi HR Case Competition held recently at the University of Alabama. Representing Athens State University and members of the winning team were Jeremy Boles (Team Captain & Athens State University Student SHRM Chapter President), Alethia Jordan, Brittany Grant, and Diana Woodward. The team was mentored by Dr. Gary Huckaby, HR Assistant Professor and Athens State University Student SHRM Chapter Advisor. Auburn University placed 2nd in the competition. Other universities with registered teams in the competition included the University of Alabama, Auburn University-Montgomery, Columbia Southern University, Mississippi State University, and the University of West Alabama. This “realistic job preview” competitive case event was designed by National SHRM and is administered annually through the SHRM State Councils. For Alabama and Mississippi students, the competition was sponsored through the AL SHRM and Mississippi State Councils. The event enables participating students to leverage their course knowledge and apply it to a practical HR situation through case simulation. During the competition, each team analyzed and solved a business case by preparing a 15-minute oral presentation that provided their consultative recommendations, which required integrated application-based HR pragmatic thinking, ethical decision-making, and strong communication and presentation skills. Presentation rounds were judged on site by a panel of certified SHRM professional members and accomplished HR practitioners. For more information, contact Dr. Gary Huckaby of Athens State University at gary.huckaby@athens.edu.